Cattle are extremely curious creatures and investigate anything and everything. Cattle have one stomach but it is divided into four compartments, the rumen, reticulum, omasum, and abomasum, the rumen being the largest compartment, this arrangement helps cattle to more efficiently digest grains and grasses. Cattle are ruminants, this means that they have a digestive system that allows them to digest foods, which would otherwise be indigestible, by the process of repeated regurgitating and rechewing of food referred to as "cud". The cud is then reswallowed and further digested by specialised microrganisms in the rumen. The rumen holds up to an incredible 50 gallons of partially digested food. Cattle chew their cud for up to 8 hours each day and they spend approximately six hours eating. Cows eat about 40 pounds of food each day and drink 30 gallons of water, approximately a bathtub full. Cattle drink water by the use of a sucking action, they do not lap up water like a cat or dog. It is estimated that there are approximately 920 different breeds of cattle in the world which collectively number an estimated 1.3 billion animals world wide. Amongst the most popular dairy and beef breeds are: Dairy, Holstein-Friesian, Jersey, Guernsey, Brown Swiss, and Ayrshire. Beef, Hereford, Brahman (or Zebu), Aberdeen-Angus, Shorthorn, Santa Gertrudis, Galloway, Africander, Charolais, and Simmental. On average a cow of about 1000 pounds will produce as much as a staggering 10 tons of manure each year. Cattle have an incredible sense of smell, they can detect odours up to five miles away and can they can hear low and high frequency sounds better than humans. In common parlance bulls, heifers, cows, calves are collectively called cows, however the correct terms is cattle. Unlike sheep, cattle may only be used in the plural; You cannot refer to one cattle as one would say one sheep. 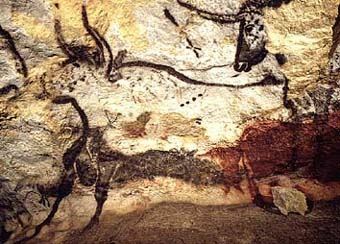 There is no singular other than to use the gender or age specific terms, such as a bull, a cow, a heifer, a calf. A young female before she has had a calf of her own is called a heifer, after she has had one or two calves, the number depending on locality, she is than called a cow, the young of both sexes are called calves until weaned. The adjective applying to cattle in general is usually bovine. A cow's udder has four sections to hold her milk. The gestation period for a cow is nine months, which is the same as humans. cows are good mothers and have been known to walk for miles to find their calves. 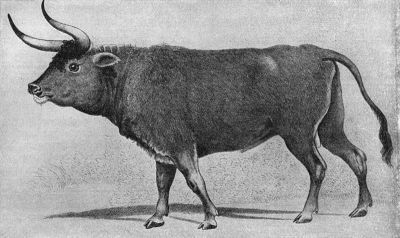 Augsburg depiction of an aurochs. In natural circumstances cattle can live 25 years or more. Cows spots are all uniquely different, there are never two with the same pattern of spots or makings. The world record for the heaviest bull, a Chianina which is an Italian breed of cattle, named Donetto was an amazing 1,740 kilograms (3,836 lb) He was exhibited at the Arezzo show in 1955.Chianina are among the world's largest breeds of cattle and for centuries were used as draft animals. legend has it that Boston grew up along well worn cow paths, the paths cows used to walk, which accounts for the general disorder and crookedness of the layout. According to the chair of the Boston Conference Committee Boston is: "a walkable city, although rarely in a straight line. The roads, and sidewalks, were laid out following old cow paths, Native American trails and long-gone shorelines. Getting “lost” is part of the enjoyment of discovering the City." 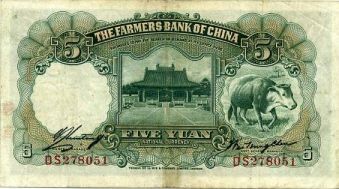 Cattle have appeared on banknotes. The example below is from the Chinese Nationalist bank, the Farmers Bank of China. 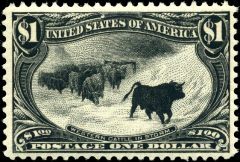 Cattle have appeared on postage stamps. The example below is the United States one dollar stamp of 1898 trans-Mississippi issue. Known as the "Black Bull", this is often considered the finest design ever seen on a US stamp. The Cow was also venerated by Mohandus Gandhi: "I worship it and I shall defend its worship against the whole world," and that, "The central fact of Hinduism is cow protection." 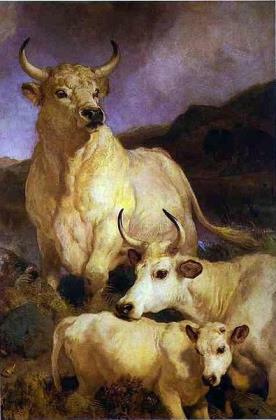 he also said described a cow as "a poem of compassion"
Cattle are members of the ox family. The ox is one of twelve animals included in the cyclical Chinese Zodiac calendar. Those born in the year of the ox are said to poses certain attributes or characteristics described as: dependable, calm, methodical, patient, hardworking, ambitious, conventional, steady, modest, logical, resolute, tenacious but can be stubborn, narrow-minded, materialistic, rigid, demanding. Taurus a major constellation in the northern hemisphere and the second sign of the western zodiac is represented by a bull. In ancient cultures, the year began with Taurus. Those born between April 21st and May 22nd are said to born under the sign of Taurus the bull and are said be practical, patient, persistent, strong-willed, solid, affectionate, warm-hearted, kind, generous ,trustworthy determined, reliable, stubborn, creative, bad tempered, idle, loyal, possessive. The Maasai tribe of East Africa traditionally believe all cows on earth where given to them by God. ​Here is the story: Forced to Flee their monastery on the Island of Lindisfarne because of Viking raids the Monks, taking with them the coffin of the revered St Cuthbert, the Lindisfarne gospels and other treasures had wondered for a century throughout the northeast settling only temporary before establishing a permanent settlement at Durham. 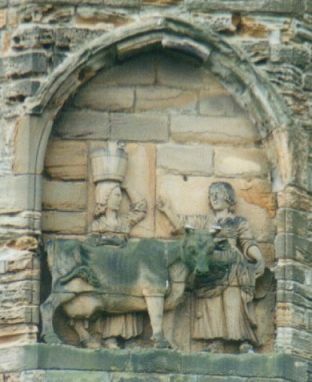 According to the twelfth century chronicler Symeon of Durham the whole occurrence was the result of divine intervention. He recounts that the coffin of St Cuthbert came to a miraculous halt at Wardon Law, and no one was able to move it. The Bishop of Chester-lee-street decreed a period of three days of fasting and prayers to the St. According to the account of St Bede, during this fast a miraculous vision of St Cuthbert appeared to Eadmer one of the monks instructing him to take the coffin to Dun Holm, which would later be called Durham. Now able to move the coffin they made their way to Dun Holm however they did not know where it was, and asking people they met on the way proved fruitless as no one it seemed knew the location or had even heard of the place. Fortunately they happened to over hear a milk maid asking another milk maid if she had seen her dun cow, which had wondered off. During this conversation the monks heard the other maid mention that she had seen the cow roaming about near Dun Holm. Thus by following the milk maid they where able to find Dun Holm, a wooded Hill located on a peninsula formed by a gorge-like meander of the River Wear, where the magnificent cathedral of Durham stands today.